The neural complex in the adult ascidian, lies between two siphons but shows different localisation and forms the basis of the nervous system (Bullock and Horridge, 1965; Chambost, 1969). The neural complex is formed from the cerebral ganglion, neural gland, the cilia channel in connection with the pharynx and the asymetric gland which shows its presence in some months (Bullock and Horridge, 1965; Georges, 1970; Chambost and Thomassin-Steck, 1975; Öber, 1989). The cerebral ganglion, whose shape and length differs among the different groups of the ascidiacea, is usually observed in an oval or spherical form (Dawson and Hisaw, 1964). As the Ciona can be 3 mms (Thiebold and Illoul, 1976), the Botryllus which forms small colonies is only a few microns (Gordeaux, 1959). Anterior and posterior nerves, whose numbers vary according to the species, exit from the cerebral ganglion. The anterior nerves later divide into branches and specifically invade the branchial siphon region, the posterior nerves, however, extend to the atrial siphon region and to the internal organs (Mackie, 1995). The neural gland structure, however lies ventrally to the ganglion in the Enterogona group and dorsally to the ganglion in the Pleurogona group (Dawson and Hisaw, 1964; Harant and Vernieres, 1933; Millar, 1966). Neural gland phases named as the Reticule, Compact and Reticule- Peripheric which emerge with structural differentiation in the neural gland during the day, have been pointed out (Georges, 1973). According to this, it could be said that, gland structure with the double layer cell line in lamellar structure is in the reticular phase and the gland structure with a great number of cells interacting with each other is in the compact phase. The reticularperipheric phase can be differentiated as an intermediate stage within these changes. In this phase, a return to the reticular phase from the periphery is initiated. The investigations on the structures bringing about the neural complex, were initated with studies accepting the origin of the neural gland. Willey (1893) has been stated to be the first to point out that the gland was of nerve origin. Peres (1943) has histologically, physiologically and anatomically investigated the neural complex of Ciona intestinalis (Linnaeus, 1767). Dawson and Hisaw (1964), as a result of studies carried out on ten different species, stated that the cerebral ganglion contains neurosecretory cells. Bullock and Horridge (1965), carried out studies concerning the lengths of ganglion cells. Olsson (1969), investigated the structural and functional variations of endocrine mechanisms of different groups and studied the stucture of tunicata neural complex under the light and electron microscopes. Peres (1943), in his findings stated three structural changes in the neural gland and Georges (1970, 1971, 1973) with the English Channel examples and Öber (1975) with the Aegean Sea examples have demonstrated this. 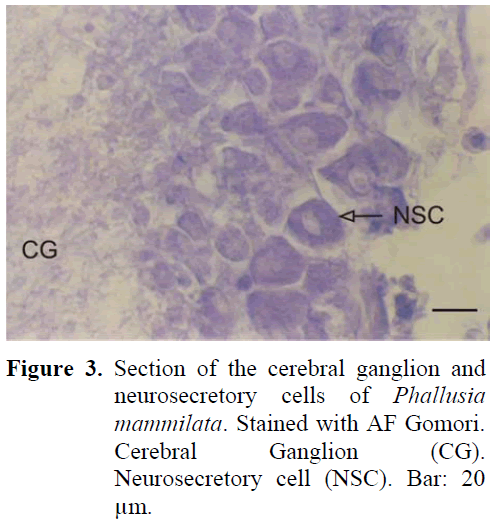 Öber (1979), in ultrastructural studies differentited four types of neurosecretory cells and three neuron types in the cerebral ganglion of Ciona intestinalis. Öber (1975), based on the studies carried out on the samples of Ciona intestinalis collected from the İzmir Coast, has found that the simple structure of cerebral ganglion. The structure is usually of oval shape and is covered by a capsular structure of medium thickness, made up of fibrillar material on the outside. According to this, two sets of anterior and posterior nerves emerge from the cerebral ganglion. Light and electron microscopy Neurosecretory cells making up two or three layers occur in the periphery of the ganglion. Neurosecretory material has been observed to be dense in cells especially in the region where anterior nerves emerge from. A definite order in the size and arrangement of cells in the periphery of the ganglion is not observed. The larger cells are usually towards the outer region of the ganglion. The average diameter of these cells are 20 μm. The axon of these cells are observed towards the center of the ganglion. The central area of the ganglion is dense with fibrillar structure and the neurosecretory material, carried in the axons, can be distinctly differentiated by staining or in relation to secretion activities. A small number of cells of 5-6 μm in diameter can be found in a disorderly fashion in this region. Reticular phase, compact phase and reticularperipheric phase have been identified in the neural gland found in the ventral region of the ganglion. The existence of the asymetric gland, which is found in the anterior of the ganglion and which is observed especially in January and February in Ciona intestinalis, has been shown with light and electron microscope studies (Öber, 1975, 1979). This study has been revised with the aim of comparing current literature on neural complexes of some ascidian samples found in the İzmir Coast, in the light of information given in studies of Öber (1975, 1979) concerning the neural complex of Ciona intestinalis. Materials were collected between the years 1997 to 1999 from the attainable stations in the Izmir coast at different times, by hand with using a spatula on the Investigation Boat EGESÜF, belonging to the Faculty of Fisheries of the Aegean University, via beam trol gravitation. The dissection was carried out in sea water and was fixed in Bouin’s solution (Öber, 2002). Samples, which were washed with 70 % alcohol after Bouin, were later immersed in paraffin and blocks were prepared from which 6 μm thicknes sections were obtained for the procedure required for light microscope studies. ‘Gomori’s Aldehyde fuchsine Staining Method’ and ‘Gabe’s Paraldehyde fuchsine Staining Method’ were carried out for staining the neurosecretion materials (Cameron and Steele, 1959). These two methods had the similar dying procedure except usage of mordant. After observation of the staining samples, they were taken their microphotographs under photomicroscope. The neural complex is in close proximity to the atrial siphon. The cerebral ganglion lying in the posterior of the dorsal tubercule is in such close proximity to each other that they are nearly adjacent. The cylinderically shaped ganglion forms two lobes by sagging from the centre. Four sets of anterior and posterior nerves leave the ganglion which is surrounded by a thin capsule which is thinner than the outer surface of Ciona intestinalis. The neurosecretory cells are approximately 18-21 μm and are found in the periphery of the ganglion (Figure 1). The neurosecretory cells are nestled around the ganglion forming one or two layers. The cell nucleus is observed to be small and the neurosecretory granules are observed to be large in structure. The axons of the cells extend to the central region of the ganglion. Together with these axons, fibrillar structure is dense in the central region of the ganglion and a fibrillar zone can be differentiated between the cortex and the medulla. The earlier mentioned three phases can be observed in the neural gland which is situated ventrally to the ganglion. 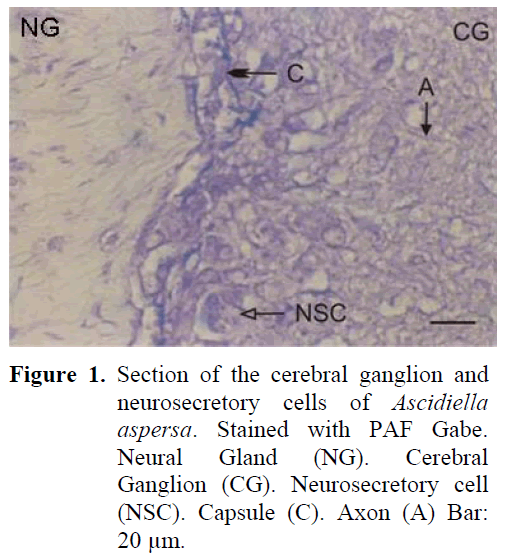 Figure 1: Section of the cerebral ganglion and neurosecretory cells of Ascidiella aspersa. Stained with PAF Gabe. Neural Gland (NG). Cerebral Ganglion (CG). Neurosecretory cell (NSC). Capsule (C). Axon (A) Bar: 20 μm. The neural complex is much closer to the atrial siphon. The ganglion is of cylinderical shape and depressed in the middle. There are five sets of anterior and posterior nerves. A thick capsule structure was observed surrounding the outside of the ganglion. The neurosecretory cells were again in the periphery of the ganglion but these cells were observed to be arranged in 6-7 layers around the ganglion and especially in the region of nerve exits. The average diameter of the cells were around 21-24 μm. The cell nucleus was observed to be big and was found to be pushed to one side of the cell and the other region of the cell contained large granules (Figure 2). The density of the fibrillar tissue, found in the central region of the gangion, was low. The axons of the neurosecretory cells extended into the fibrillar tissue in the central region. Small cells could be differentiated in this region. The neural gland was ventral to the ganglion and opened to the atrial space. All three phases were observed in the gland structure. Figure 2: Section of the cerebral ganglion and neurosecretory cells of Ascidia mentula. Stained with PAF Gabe. Cerebral Ganglion (CG). Neurosecretory cell (NSC). Axon (A) Bar: 20 μm. The neural complex is established near the atrial siphon. The ganglion is of cylinderical shape and there are two sets of anterior and posterior nerves. These nerves were later observed to separate into branches. The periphery of the ganglion is surrounded by a thin capsule from the outside and there are neurosecretory cells in this region containing granules. The diameter of these cells were 21-25 μm (Figure 3). The cells were positioned in the periphery of the ganglion, forming 3-4 layers. The nucleus was found in the middle of the cell. The neurosecretory granule structure was thinner in comparison to earlier examples. The granules were homogeneously distributed in the cell. Dense fibrillar tissue was present in the central region of the ganglion. The neural gland was ventral to the ganglion. Different phases were observed in the gland during the study. Figure 3: Section of the cerebral ganglion and neurosecretory cells of Phallusia mammilata. Stained with AF Gomori. Cerebral Ganglion (CG). Neurosecretory cell (NSC). Bar: 20 μm. The ganglion is of spherical structure and much smaller than the others. There are two sets of anterior and posterior nerves leaving the ganglion which is surrounded by a thick capsule from the outside. Neurosecretory cells show a disorderly distribution in the periphery of the ganglion (Figure 4). The axons of the cells extend in different directions and a cellular zone formation can be differentiated. The diameter of these cells are 12-16 μm, much smaller than the neurosecretory cells of all the other types. Neurosecretory granules have also been identified to be smaller and of lesser number than all the other types. The neural gland is ventral to the ganglion and reticular, compact and reticular-peripheric phases have been observed during the study. 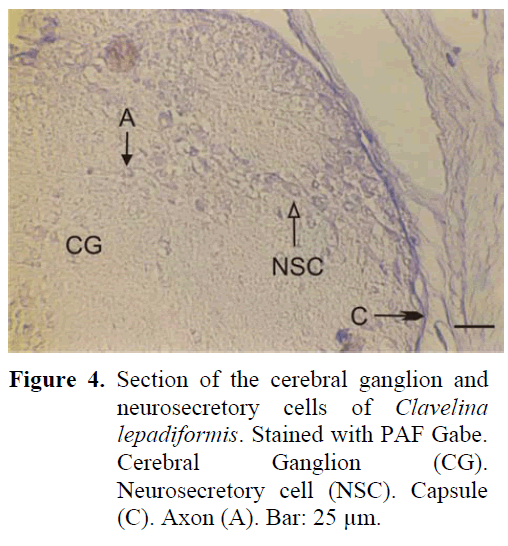 Figure 4: Section of the cerebral ganglion and neurosecretory cells of Clavelina lepadiformis. Stained with PAF Gabe. Cerebral Ganglion (CG). Neurosecretory cell (NSC). Capsule (C). Axon (A). Bar: 25 μm. The neural complex is closely positioned to the branchial siphon. The ganglion is thin, long, in the shape of a spindle and is surrounded by a thick capsule from the outside. Four anterior and four posterior nerves leave the ganglion. The region between the ganglion and the neural gland, found in the dorsal region, is indented towards the inner surface. A large amount of neurosecretory cells are found especially in this indented region and cells form irregular layers in this region (Figure 5). The diameter of these cells are 18-21 μm. Although neurosecretory cells can spread in a region in the ganglion periphery, distribution of these cells can also be observed in the inner regions of the ganglion. The granules in these cells are of a larger type. The neural gland was in general identified to be in the reticular-peripheric phase during the study. 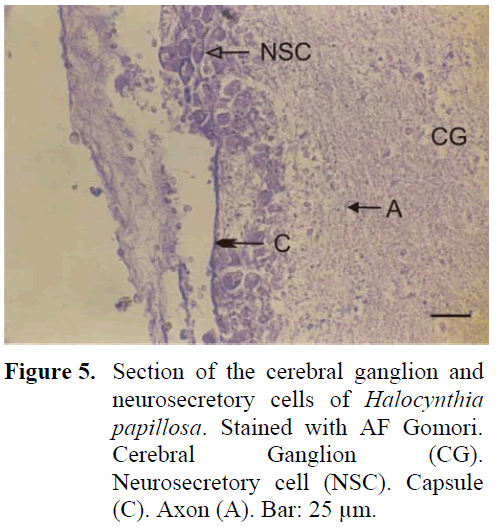 Figure 5: Section of the cerebral ganglion and neurosecretory cells of Halocynthia papillosa. Stained with AF Gomori. Cerebral Ganglion (CG). Neurosecretory cell (NSC). Capsule (C). Axon (A). Bar: 25 μm. The neural complex is adjacent to the branchial siphon. The ganglion is of a near spherical but of oval shape and is surrounded by a thin capsule from the outside. There are two sets of anterior and posterior nerves. Nodular formation is observed at the site of cell exit. The neurosecretory cells, found in the periphery of the ganglion are closer to the gland and thus are concentrated in the dorsal of the ganglion. The average diameter of these cells are 18-20 μm (Figure 6). The neurosecretory granules are usually of thin structure. The axons extending from the periphery to the centre of the ganglion can be easily observed. A dense fibrillar tissue is present around the cells which are at times observed in the central region. The neural gland was generally observed to be in the compact phase. 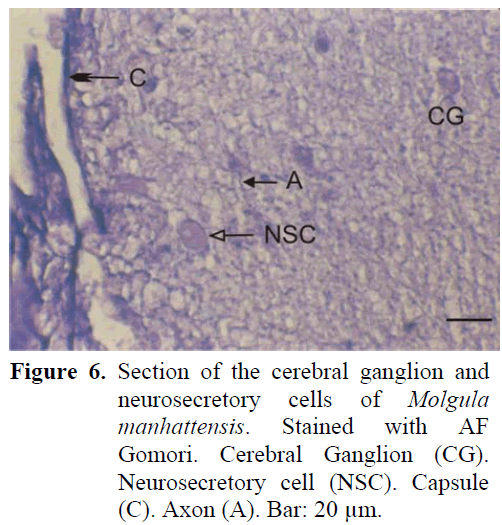 Figure 6: Section of the cerebral ganglion and neurosecretory cells of Molgula manhattensis. Stained with AF Gomori. Cerebral Ganglion (CG). Neurosecretory cell (NSC). Capsule (C). Axon (A). Bar: 20 μm. The dissection of the material, was carried out in sea water. Dawson and Hisaw (1964) have reported that although Helly, Lavdowsky solution, 10 % formaldehyde and osmiumtetraoxide can be used as fixatives, none of them had better advantages than the Bouin fixative. Although formaldehyde and Bouin were used during our study, as investigators have reported, better results were obtained with Bouin. Dawson and Hisaw (1964) have again reported that they have applied aldehyde fuchsine Gomori (counter stain Halmi), chrom alum, hematoxyline and paraldehyde fuchsine Gabe dyes, and that while sometimes only the body of the cells from the samples were observed at other times the axons were only observed and seldomly the whole cell was observed. Öber (1975) has however used; Heidenhains Azan, Heidenhains Hematoxylene, Alcian blue PAS Orange-G and Massons trichrom dyes alongside the above mentioned dyes, and has stated that in order to observe the secretion, Gomori’s aldehyde fuchsine, paraldehyde fuchsine Gabe dyes gave better results. In this study, paraldehyde fuchsine Gabe was used to observe the neurosecretory material in the ganglion and Gomori’s aldehyde fuchsine was used to dye the neural gland and the channel and the findings were found to be in accordance with Dawson and Hisaw (1964) and Öber (1975). The site of the neural complex in the Ascidiacea shows differences according to the species (Harant and Vernieres, 1933; Lender and Bouchart, 1964). The neural complex of Ascidiella aspersa, Ascidia mentula, Phallusia mammilata and Clavelina lepadiformis are closely positioned to the atrial siphon, the neural complex of Halocynthia papillosa and Molgula manhattensis are however observed to be closely positioned to the branchial siphon. Markman (1958) reported that the number of the nerves leaving either edge of the cerebral ganglion of the neural complex elements were not constant. Dawson and Hisaw (1964) have stated that the distribution of the nerve endings were not followed and that the presence of regional depot edges were not revealed. Mackie (1995), studied the nervous system of the Ciona in detail and reported that anterior nerves which separate into branches surround the branchial siphon region and the posterior nerves surround the inner organ region. In our study we have observed that there are 5 sets of anterior and posterior nerve exits in the Ascidia mentula, 4 in the Ascidiella aspersa and Halocynthia papillosa, 2 in the Phallusia mammilata, Molgula manhattensis and Clavelina lepadiformis. The quoted thickness of the capsule surrounding the cerebral ganglion in the Ciona intestinalis has been determined to be a baseline, Ascidiella aspersa, Phallusia mammilata and Molgula manhattensis have thinner capsules than Ciona, and it can be said that the other examples have a thicker capsule structure. According to this, Halocynthia papillosa has been observed to have the thickest capsule structure and Ascidiella aspersa the thinnest capsule structure. Dawson and Hisaw (1964), have investigated ten separate Ascidiacea species in a study they have carried out. 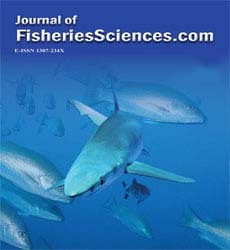 In this study the compatibility of samples collected from the Izmir Coast is only observed in the Ascidia and Halocynthia genus level. Dawson and Hisaw (1964) have investigated the neural complex structures. They have shown; the presence of neurosecretory cells in the periphery of the cerebral ganglion and that these cells surround either a fibrillar core or a central region and have also shown the cell arrangement in the cortical zone. This arrangement shows important variations in different species and in different regions of only one ganglion. Öber (1975) has stated that neurosecretory cells in the Ciona intestinalis increase near the region of the ganglion where cells exit and that cells form 3-4 layers. In this study, 1-2 cell layer formation in the Ascidiella aspersa, 6-7 in the Ascidia mentula, 3-4 in the Phallusia mammilata and Molgula manhattensis, and irregular layer formation in the Clavelina lepadiformis and Halocynthia papillosa were identified. Bullock and Horridge (1965) and Öber (1975) concentrated on the dyes of the ganglion cells of the Ciona intestinalis and have determined that cells in the periphery of the ganglion were 20 μm and cells in the centre were around 5 μm. In our study, the diameter of the neurosecretory cells in the periphery of Ascidiella aspersa and Halocynthia papillosa were found to be 18- 21μm, 21-24 μm in the Ascidia mentula and 21- 25 μm in the Phallusia mammilata, 18-20 μm in the Molgula manhattensis, and 12-16 μm in the Clavelina lepadiformis, and 5-6 μm in diameter on average in the cells of all types found in the central region of the ganglion. Öber (1975), on the basis of studies carried out under the light microscope divided the neurosecretory cells into three groups according to the granule content of the cells; 1) very finethin- granule, 2) darkly dyed large granule and 3) those stacking the secretion in a pile. Dawson and Hisaw (1964) have pointed out the difficulty of differentiating the granule content of neurosecretory cells under the light microscope. In our study, as well as determining that granular structure shows differentiation of neurosecretory cells within one species, we have also described Clavelina lepadiformis, Phallusia mammilata and Molgula manhattensis as generally containing small granule and Ascidiella aspersa, Ascidia mentula and Halocynthia papillosa as generally containing large granule. Fibrillar tissue is generally found in the central region of the ganglion. Sometimes, the axons of cells in the cortical zone, are observed to extend among these fibrils. In our study, the extension of Clavelina lepadiformis and Molgula manhattensis, in particular, have been observed. In Ascidiella aspersa however, a fibrillar zone consisting of fibril between the cortex and the central region is typical. The site of the neural gland may differ according to groups. The gland is ventral to the ganglion in the Enterogona group and dorsal to the ganglion in the Pleurogona group (Harant and Vernieres, 1933; Millar, 1966). Three phases; “Reticular“, “Compact“ and “Reticular- Peripheric“, have been differentiated in the neural gland in one day and the gland was observed to release free-cells directly as secretion (Öber, 1983; Peres, 1943). Georges (1971), has reported that the gland changes from an epithelial structure to a mesenchymal structure in one day and the that three phases repeat twice in one day and Öber (1975), stated that this differentiation in the same animals was tracked once per day. In this study, however, due to the fact that the determinations were carried out independently on particular hours, all three phases were observed in all the samples. Reticular, compact and reticularperipheric phases were differentiated in the gland structure. However, gland structure in the compact phase was frequent in the Molgula manhattensis and gland structure in the reticularperipheric phase was more frequently observed in the Halocynthia papillosa. This result can be a coincidental event, due to studying independent of time, on particular hours. In conclusion, in view of the example; Ciona intestinalis, the neural complex structure of some ascidiacea of which no information concerning the neural complex was given up to date and which was typical of the Izmir Coast was investigated in this study. According to this, definite differences among the examples were observed to occur due to structure of the cerebral ganglion, the distribution of cells in the ganglion, anterior and posterior nerve exits and the position and structure of the neural gland. Better and more precise results will only be possible with comparitive studies with the electron microscope. Bullock, I. H., Horridge, G. A., (1965). Structure and Function in the Nervous Systems of Invertebrata, Tunicata, 2: 1577-1588. Cameron, M. L., Steele, J. E., (1959). Simplified Aldehyde-Fuchsin Staining of Neurosecretory Cells, Stain Technologie, 34: 265-266. Chambost, M. D., (1969). Etude du Complexe Neural de Cionaintestinalis L., Tethys I, 3: 901-914. Chambost, M. D., Thomassin-Steck, C., (1975). Etude de la Fréquence de la GlandeAsymétrique chez, Cionaintestinalis L. Extrait des Annales de la Societe Royale Zoologique .de Belgique, 1: 1-14. Day, E. C., (1976). The Physiology of the Nervous Systems of the Tunicate, The Journal of Experimental Zoology, 34(1): 45-66. Georges, D., (1970). Variations Circadiennes de la Structure de la GlandeNeurale chez Cionaintestinalis (Tunicier, Ascidiacé), Comptesrendus des seances de l’Academie des sciences, Paris, Serie D, 270: 3137- 3140. Georges, D., (1971). Le RythmeCircadiendans la GlandeNeurale de l’AscidieCionaintestinalis, Etude d’AnatomieMicroscopique. ActaZoologica, 52: 257-273. Georges, D., (1973). Fonctıonnement Rythmique du Complexe Neural Et ControleNeuro- Endocrinien de la Ponte chez Cionaintestinalis L. (Tunicier), ComptesRendus du Quatre-Vingt-SeiziémeCongrés National des SociétésSavantes Toulouse, 1971 Sci.t.III, 27-39. Godeaux, J., (1959). Sur la glandeNeurale de Botryllusschlosseri, Bull. Soc. Royale Sciences Liege, 28(1-2): 14-17. Harant, H., Vernieres, P., (1933). Fauna de France, 27 Tuniciers. Fasc. 1: Ascidies. 100 pp.Paris, France. Lender, T., Bouchart, M. C., (1964). Etude Expérimentale de la Régéneration du Complexe Neural de Cionaintestinalis (Prochordé), Bulletin de la SocieteZoologique de France, 89: 546-554. Mackie, G. O., (1995). On the ‘ Visceral Nervous System’ of Ciona, Journal of Marine Biololy, U. K. 75: 141-151. Markman, B., (1958). On the Peripheral Nervous System of Ascidians, ActaZoologica, 1958. XXXIX.,1-6. Millar, R. H., (1953). Ciona. LMBC Memoirs on Typical British Marine Plants and Animals, 35: 1-123. Millar, R. H., (1966). Tunicata, Ascidiacea. Marine Invertebrates of Scandinavia Uni. Oslo, 1: 1-123. Öber, A., (1975). Ascidiaceae Klassisinde Serebral Ganglion ve Nöral Bezin Histolojik Araştırılması, Tubitak V. Bilim Kongresi. Öber, A., (1979). Neurosecretory Cells of the Cerebral Ganglion in Cionaintestinalis (Tunicata) X. C.E.C.E International Endocrinology Congress, Sorrento Italy. Abs. Book. pp. 148. Öber, A., (1983). Ciona intestinalis (Tunicata, Ascidiacea)’ de Nöral Bez Kanalının Işık ve Elektron Mikroskobu ile İncelenmesi, Ege Univ, Faculty of Science. Journal Series B. Suppl. 380-387. Öber, A., (1989). Localization and Ultrastructure of Asymmetric Gland. EgeUniv, Faculty of Science. Journal Series B., 11(2) : 35-40. Öber, A., (2002). ZoolojideLaboratuvarTeknikleri- Ders Kitabı. EgeÜniversitesi Fen FakültesiKitaplarSerisi :189. Bornova, İzmir. Peres, J. M., (1943). Recherchessurle sang et les OrganesNeuraux des Tuniciers, Annales de l’Institutoceanographique de Monaco, 21: 229-359. Thiebold, J., Illoul, F., (1976) Recherchessur la Neurosecretion chez uneAscidieCionaintestinalis, Bulletin SoietyHistologiqueNationale African Nord, 56 : 87-97. Willey, A., (1893). Studies on the Protochordata. I. On the origin of the branchial stigmata, praeoral lobe, endostyle, atrial cavities etc., in Cionaintestinalis, Linn., with remarks on Clavelinalepadiformis, Quarterly Journal of Microscopical Science, 34: 317-360.